This print started off as an elaborate satire on the ‘enthusiasm’ of Methodist preaching. 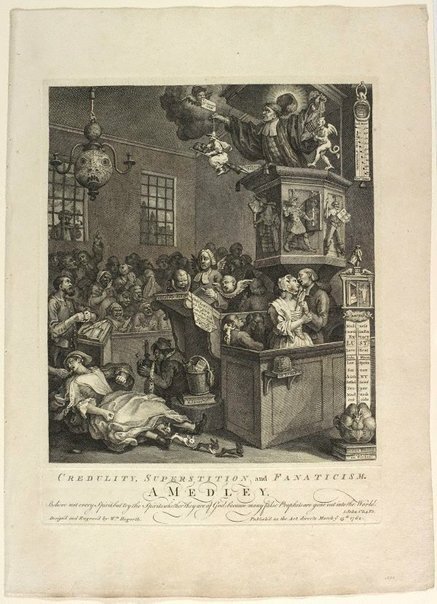 Hogarth later revised the composition, extending it to a broader attack on ‘credulity, superstition and fanaticism’. The fainting woman on the left is Mary Tofts, who tricked people into believing she gave birth to rabbits. On the right, a religious thermometer measures the congregation’s reaction to the sermon. The preacher, holding puppets of a devil and a witch, is exposed as a charlatan by his harlequin shirt. His falling wig reveals a monastic tonsure, suggesting that Methodism and Popery amount to the same thing. Unknown, Hogarth's graphic works , New Haven, 1965, no 210. Unknown, Hogarth’s graphic works , London, 1989, pp 175–78, no 210a, illus p 409.